UPDATE: Since Mom kept raving about her Only 8 ice cream that she had on Saturday, after her doctor appointment, I headed for Eskimo King around 8 p.m. so that I could try some as well. She got a small cup of coffee (what else is new) and I got a small cup of one of their new flavors - chai tea. The total came to $5.99 and our cups were served very quickly. Mom was right! This ice cream imposter tastes fantastic and almost exactly like the real thing. Both flavors were delicious, and we loved the fact that we were eating something that was good for us and it actually had flavor. Thank you, Eskimo King! 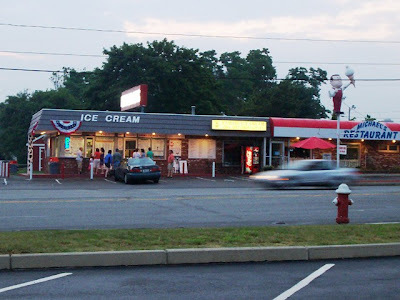 If you're a fan of New England Bites, you know by now that Mom and I love ice cream. 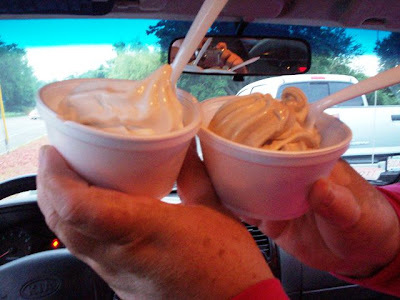 It is our favorite dessert by far, and in the summer we always hit every local ice cream place to get a cup of creamy goodness. Since we hadn't visited Eskimo King since last year, we decided that today was the day. We pulled in to the always-busy parking area at just around 6:45 p.m.
Eskimo King is amazing. 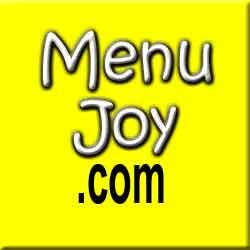 Where else can you get over 250 flavors of soft serve ice cream? They have everything from Fluffer Nutter and coconut cream cheesecake to cantaloupe and white chocolate apricot. Eskimo King also has a wide variety of hard and sugar free ice creams, non- and low-fat yogurts, sherbets, cakes, sorbets, cones, sundaes, Arctic Colattas (slush), smoothies, sodas, frappes, and many other ice cream novelties like banana splits and blizzards - complete with a long list of possible mix-ins. They even have a doggie dish available for your hungry pooch which is topped with a Milkbone. The prices are very reasonable - two ice creams are almost never over $7. Mom and I enjoy the look of Eskimo King. It looks as if the owner makes all of the signs herself, and they're always colorful and loaded with information. It also seems like Eskimo King is a nice place to work, because Mom and I have always had good service here - even when we've had to stand in line for quite some time. This is a very popular summertime hot spot. Mom even ordered an Eskimo King cake for my birthday one year just as they were about to close down for the season and it was superb. Safe for most diabetics and lactose intolerants. Great taste that won't go to your waist. She was really anxious to try this yogurt, so when we placed our order she asked for a coffee flavored Only 8 milkshake. I went with a large wafer cone of pineapple nut cheesecake. The service was quick today because we had found a window on the side of the building that no one was standing at. 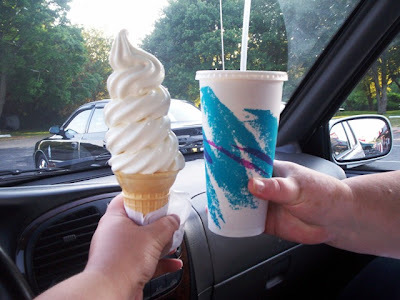 Our total came to $7.19, and once we paid and got our ice creams, Mom and I headed back to my car. Once inside, I made sure to take a picture of my cone because it was a little steamy outside and I didn't feel like wearing any of the ice cream. Like always, my cone was delicious. I could really taste the nut flavor, and it had the aftertaste of refreshing pineapple. Although sometimes you only get a hint of the actual flavor (they use a vanilla or chocolate base for all their ice creams), sometimes they hit the nail right on the head. Mom's experiment with the Only 8 frozen yogurt left her amazed! She said that she couldn't believe how much it tasted like real ice cream. It was very thick, creamy, and had a very strong coffee flavor - stronger than some of the real ice cream shakes. She was very impressed with it and would definitely get it again. She just hopes that it doesn't turn out to be like the "fat free" yogurt on that Seinfeld episode, ha, ha! Happy and full of ice cream, Mom and I sped off into the sunset vowing to return to Eskimo King as soon as we can. Although it was our first trip of the year, it definitely won't be our last. From November to March, whenever we drive down Market Street and see that giant figure of a boy holding an ice cream cone, we just wish for the day when spring would arrive and that neon OPEN sign would turn on. 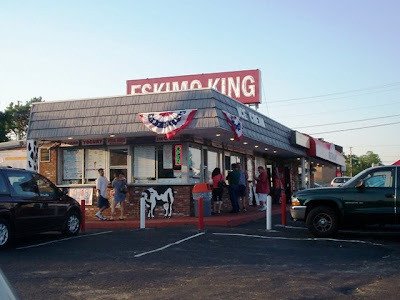 Eskimo King is open from 11 a.m. to 10 p.m. Sunday through Thursday, and 11 a.m. to 10:30 p.m. Friday and Saturday.